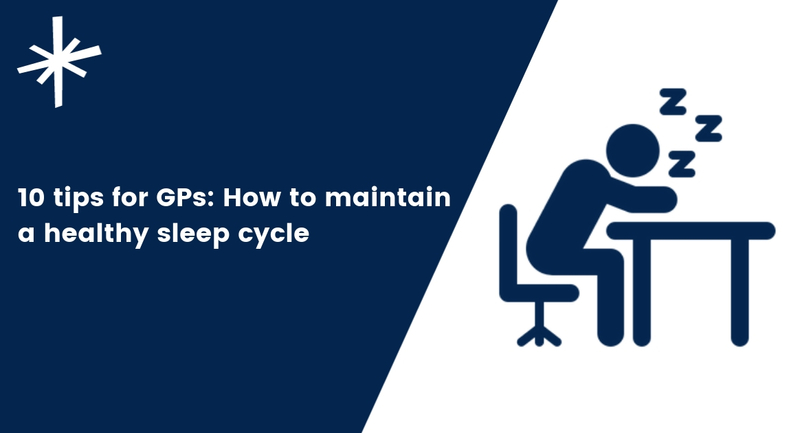 For anyone working in the healthcare industry, sleep and rest is vital - especially for those who work directly with patients and give out medical advice. Lack of a good night’s rest can cause irritation and lack of concentration - something that can be serious (potentially fatal) if it leads to a mistake when diagnosing a patient. It’s often new GPs who find it difficult to maintain a balanced sleeping pattern, but it can also happen to GPs who have been practising for years. With expertise from other GPs and NHS advice, we’ve put together 10 easy tips for GPs to ensure that you are getting a good night’s sleep and are on top of your game for patient care. As a medical professional, if you struggle to get a good night’s rest, then a simple first step is to track your sleep. In order to understand why you aren’t sleeping properly you first need to evaluate why. Modern technology, such as smartwatches and health trackers have made this process so much simpler. They aren’t infallible, but sleep tracking devices and apps, such as Sleepio (an NHS-approved app), give a good indication of how many hours of sleep you are actually getting and the stages of sleep you undergo; whether you fall into a deep (REM) sleep, or merely having a light snooze. Most adults need between six and nine hours of sleep every night. GP’s are no different; by setting yourself a strict schedule, your body will progressively adjust itself to ‘switch off’ upon bedtime. This doesn’t just mean going to bed and waking up at the same time everyday, it’s also about when you eat breakfast, dinner, watch TV and switch yourself off from ‘work mode’. It becomes a little bit tricky for healthcare professionals who work flexible or extended hours, such as locums. But it’s good practice to ensure you are sleeping regular hours and sticking to a schedule. It’s obvious, but not always so easy to implement. GP’s tend to drink a lot of coffee and tea during work hours, both of which interfere with the sleep process. You don’t need to cut caffeine out of your diet entirely, but aim to stop drinking it about 8 hours before you plan to sleep. If a hot drink is needed in the afternoon or evening, try herbal teas or warm milk instead. Similarly, stress-induced eating, drinking and smoking, will negatively affect your sleeping patterns and disrupt your body throughout the night. Moderate workouts, such as swimming or walking, are a great way to relieve stress before or after a clinical session. By dedicating time to keeping your body fit and healthy, no matter how tiring your day was, you will quickly adapt to your new proactive routine and have a much easier time falling asleep. GPs and healthcare professionals often let their work consume their lives, both inside and out of work. The first step to prevent this is to take your breaks at work. It’s not good to think that you can eat and drink at your desk while working - yes you have the ability to do so, but you shouldn’t. Breaks give you a chance for your brains to rest and relax a bit. Don’t overexert yourself – this can lead to stress and slower productivity throughout the day, which then leads to working late or worrying about not finishing work on time. It’s better to take your allotted breaks and coming back to work refreshed, than pushing on through breaks to try and get work done. For GPs who simply must check their emails after leaving the practice, a good method to avoid excess stress is to do those final checks after eating dinner. When you cook and sit down for a meal, your brain begins to relax without fully switching off. You can then take a bit of time to read your important messages, before stopping permanently for the night. It is important to prioritise your well being and take a moment to wind down. Calming activities will progressively relax your body, reduce stress-levels and prepare you for sleep. And if you still can’t sleep, get up. Tossing and turning in your bed will only increase restlessness. Get up and read a book or do a relaxing activity until you feel tired again. If you tend to lie awake in bed thinking about your patients and tomorrow’s sessions, set yourself a moment before bedtime to make plans for the next day. By writing down your stressful thoughts, you’ll arrive to your practice prepared, and will spend less time feeling anxious when you’re in bed, and more time falling asleep. Take the opportunity to create yourself a suitable sleeping environment. Your bedroom needs to be the ideal relaxing and peaceful space for you to sleep. Invest in a comfortable mattress, get rid of any noisy electronics, tidy up clutter, adjust the temperature control, and make sure your room is dark and quiet. All these factors are key components to creating the perfect atmosphere for you to fall (and stay) asleep. Our eyes and brains react to the artificial light in electronics (i.e. phones, TVs, etc.) and that keeps our brains animated for longer. So make sure to your screens off in advance of sleeping. But, just as important, is the use of natural light to wake up. Once your alarm goes off, the best thing to kick your body into your wake-up routine is to open the curtains and let natural light in. This helps to reduce the slugging feeling in the morning and attunes your body to feel tired when it's dark and feel awake in daylight. If you’ve followed these steps and your sleeping concerns are persistent, please seek direct help from a professional. Lack of sleep can aggravate health issues, weaken your mental state and affect your ability to stay focused at work. Remember, happy doctors make happy patients! For any bank or locum GPs looking for further help managing their work schedule and reduce admin time, Locum Organiser is a toolkit to organise locum life, organise your diary and complete your tax return and pension. Lantum is a suite of tools to help GPs with all aspects of finding work and getting paid fast.